Saw Armor is a Custom Shop which designs and produces accessories to help Pro tool users be safer and more productive. Our customers include Fire and Rescue, Law Enforcement, Construction and other industrial power tool users. We started with designing and building our "armor plates" to ruggedize fire department chainsaws. In addition, we are a Makita Factory Trained Pro Dealer for gasoline and battery powered tools and can provide Makita gas & battery solutions by themselves or bundled with our custom accessories. 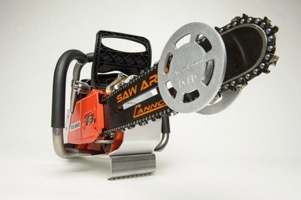 Upgrades and accessories for STIHL Husqvarna, Jonsered, Dolmar and Makita chainsaws. Wall mount battery brackets for Makita DC18SF and DC18RD chargers. We help Pro power tool users select the right tools for the job, be safer and more productive by using some of the accessories that we offer. Our Custom Shop is always open for new ideas and developing innovative solutions. This has given us a wealth of knowledge for many environments., which we use to consult and advise our customers and dealers. Contact us today so we can hear about your situation and see if we can help! 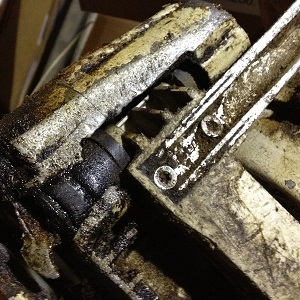 During a visit to a local STIHL dealer, they showed us a MS 460 chainsaw that had come off a fire truck. 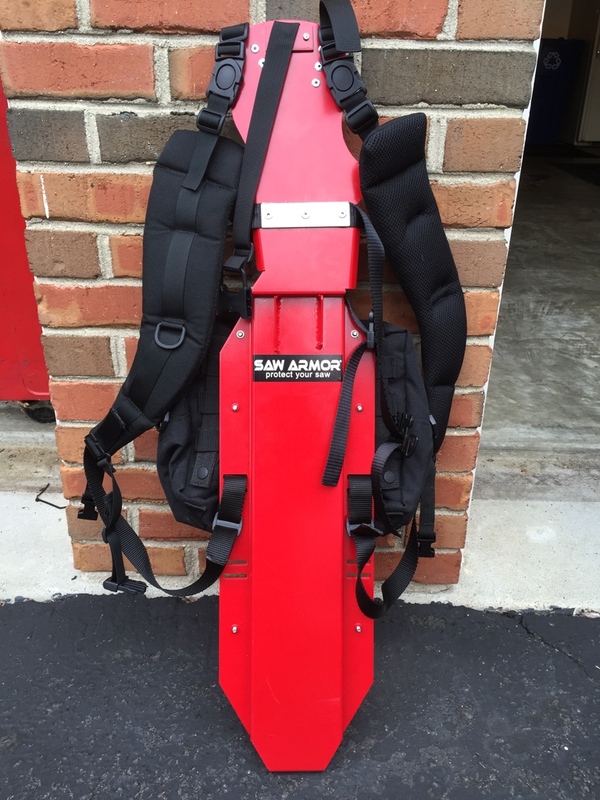 We wanted to help Fire Departments extend their saw's lifespan and reduce downtime from unexpected impacts/falls etc. Like a bash plate on a motorcross bike or a skid plate under a rally car, Saw Armor Custom Shop armor plates protect the vulnerable underbelly of power saws, providing an armored barrier against damaging abrasion or other forces. Below you can see a saw with Saw Armor and one without. These photos were taken at Kentland 33 in Maryland, which is known as an innovative, all volunteer department founded around a kitchen table in 1951. Kentland 33 called me and asked if I could help them with an equipment donation. They said they could use a new roof saw. 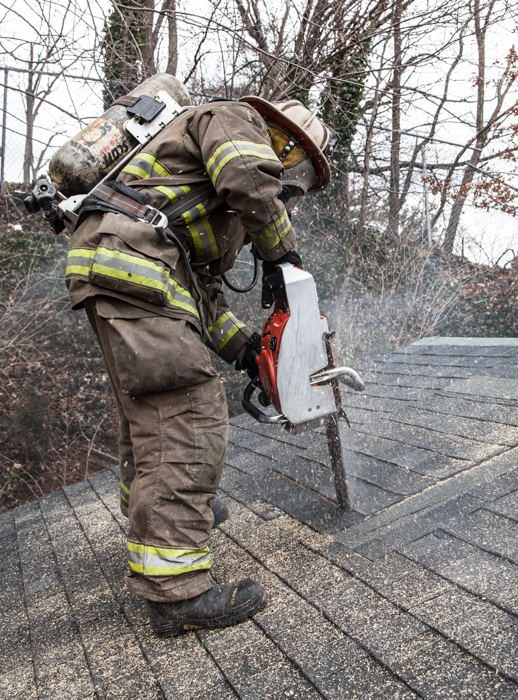 A few days later, we tested the first Saw Armor Custom Shop saw on Kentland 33's vent prop (a mock roof built up from 2 by 4's, asphalt shingles and plywood for training). 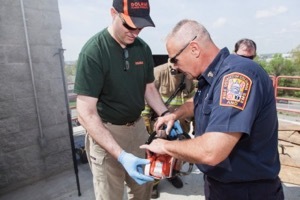 The tests went well, and we donated the first saw we built to Kentland 33 Tower Ladder. A few more saws were added later. We looked at a few other custom saws on the market for first responders, and then spent a year working with the DC Fire Training Academy. We learned a lot by working closely with team and conducting months worth of testing and development together. 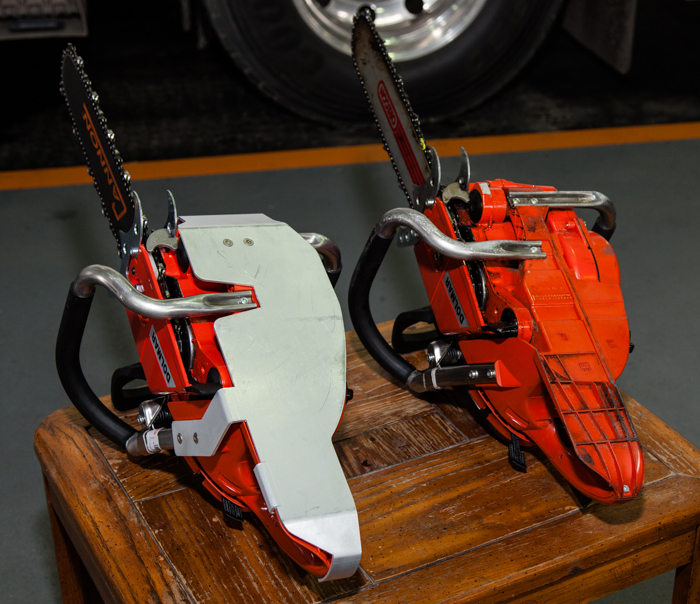 DC Fire awarded Saw Armor a contract to supply a combined total of 56 chainsaws and rotary cutoff saws, all built by the Saw Armor Custom Shop. Why stop there? There were new things learned along the way and more things to be done. We heard about a thing called "Helitack" firefighting. It involves flying a firefighting crew on a helo to forest fires, dropping them off so they can hike to the fire and start "cutting line" . This sounded really cool. And very dangerous. They said that they were trying to develop a better way to carry their chainsaws to and from their LZ (helicopter landing zone). Fighting fire all day over rugged terrain and having to hike out at the end of a hard days work puts huge stresses on a persons body. A trip to the Fortuna, CA area where Cal Fire Helitack C-102 is based soon helped me understand at least some of what was going on. 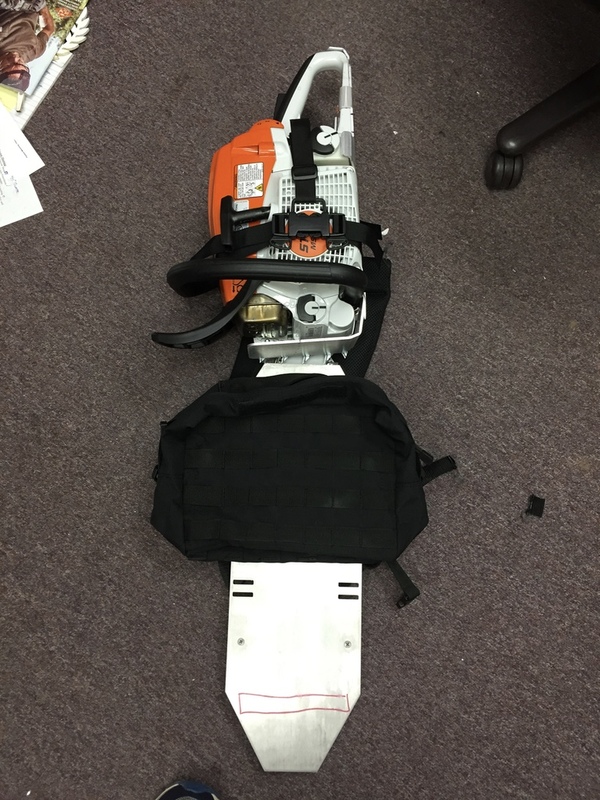 The crew had rigged up a backpack for their chainsaws made out of firehose and some old USAR straps (they called it "Frankenstein"). It kinda worked, but could use some improvements. Like making it out of aluminum and more sturdy. See here our first attempt at what was the start of the SawPack and a few upgrades later..